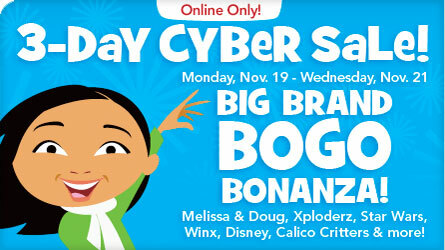 Toys R Us BOGO Half Off Cyber Sale Through November 21st! You are here: Home / Deals, Giveaways and Special Offers / Deals / Toys R Us BOGO Half Off Cyber Sale Through November 21st! If you don’t want to wait until Black Friday to start your holiday shopping, Toys R Us is offering you an incentive. Now through Wednesday, November 21st, you can get a BOGO half off sale on your favorite products. For example, Buy 1 Melissa and Doug product, get the second one 50% off. Or Buy 1 Star Wars or Marvel Action figures and get the second one 40% off. Remember this is an online deal only, so visit Toys R Us and look for these great deals!